The LivLyme Foundation (“LivLyme,” “we,” “our”) takes many steps to protect your privacy when you visit the LivLyme website (“Site”). 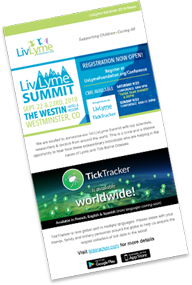 In order to advance our outreach programs, and to provide you with a better experience while you are on the LivLyme Site, we do allow some tracking to take place. How and when we do so is explained below. Like most websites, we may automatically receive and record information in our server logs from your browser when you the Site. The information that we collect with these automated methods may include your IP address, cookie information, browser type, system type, and the referring URL. We use this type of information to measure and improve the performance of our site. On occasion we also access this type of information to investigate or maintain the stability and security of our site. Contact you about other LivLyme activities or news, or about opportunities to support LivLyme. If you sign up for our email list, we may collect data by using an embedded image to track whether you open our email and by using a URL that enables us to identify that you have taken an action, such as clicking a link in an email or signing an online petition. This allows us to build a more effective educational program and to inform you about issues you care about most. We work with a variety of vendors who help us process data, facilitate the operation of the LivLyme site and deliver messages to you on other platforms. For example, outside vendors may help us analyze traffic on our site, process credit card transactions, or facilitate activities such as the collection and delivery of petition signatures. To the extent that any vendor has access to personally identifiable data about you, by virtue of the fact that it participates in the operation of the LivLyme site, we require that vendor to promise that it will keep that data confidential and use it only for the purpose of carrying out the functions we have engaged it to perform (with a limited exception for certain aggregated data, as described immediately below). That is true both as to passively collected data and as to voluntarily submitted data, and also as to data from any cookie or other tracking device. In some instances, we may agree to allow a vendor to take aggregated and anonymized data about activity on the LivLyme site, and use that data for other purposes such as improvement of the vendor’s products or benchmarking for the vendor’s other clients. But we won’t agree to that unless we believe, in each instance, that the data won’t be recombined with other information to create any record about you as an identifiable individual. Website performance cookies allow us to make the website easier and more pleasant to use. For example, they may enable us to save you time when filling out a form by populating it with information you provided in previous visits. 200 children a day are diagnosed with Lyme disease. That is 4 school buses of children a day in the US.